Good Friday: 10 a.m. - 4 p.m.
Easter Saturday: 9 a.m. - 5 p.m.
Easter Monday: 10 a.m. - 4 p.m. Through the use of Therapeutic Horticulture, Chestnut Nursery helps to restore mental well being, and give purpose to people’s lives. Our home grown plants span a wide range, suitable for all gardening requirements and are grown to the highest standard. 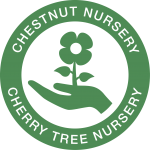 Although Chestnut Nursery now covers around half of its running costs through plant sales, we are aware that the project will always rely heavily on donations and we need your support so click the button below to find out more. Every year we grow over 50,000 healthy plants across a range of more than 500 different varieties and species; everything form edible crops, annual bedding, hardy shrubs, wildlife friendly perennials and even unusual exotics particularly suited to local conditions. We’ve got a lot to share! If you want to keep up-to-date with everything that happens at the Nursery – particularly the build and our new shop – and to learn about our Events, then sign up for our Newsletter.